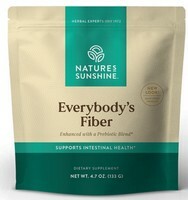 Everybody’s Fiber [Intestinal] is a bulk powder product that combines fiber and herbs for cleansing and soothing the digestive system. Fiber is critical to colon health and proper digestive function. And each serving of Everybody’s Fiber provides 3 full grams of dietary fiber! This blend contains apple pectin, a soluble fiber that has adsorbing and bulking properties; slippery elm bark, which forms a gel when mixed with water and helps things slide along smoothly; chamomile flowers; short-chain FOS—a soluble fiber that provides food for friendly microorganisms in the colon; flax meal—provides soluble fiber and supports colon health; marshmallow root, which is soothing and adds fiber. Also contains asparagus stems, peppermint leaves, fennel seeds, uña de gato inner bark, stevia extract, natural peach, apricot and plum flavors, plus malic acid. Everybody’s Fiber can be used by... just about everybody! Mix 1 scoop powder (5 grams) in 4 ounces water or juice and drink daily. Not for use by children under 12 years of age.